Since we moved into our Eichler, we’ve had a love-hate relationship with the dual sliding garage doors. Of course their unique design and style means that we’d never replace them, but getting out of the car during the rainy winter to pull a heavy door open meant that style had a cost. Since the pine cones from our tree can dent cars, leaving things alone wasn’t an option. Clearly, something had to be done. We decided to do the garage door openers ourselves because no one wanted to attempt doing a job that would involve powering both doors. There were a few obstacles endemic to all Eichlers, but nothing insurmountable. The key is developing an attachment to the garage doors that takes the overlapping into account. This also means that you have to be extra careful to not operate the wrong door at the wrong time, as various parts will collide and possibly damage your setup. The basic idea here is that we installed garage door openers in the front corners of our garage, with the rails and trolleys moving sideways and parallel to the path of the doors. The rails themselves will be mounted to a piece of wood that spans the gap between beams. We went with the cheapest garage door opener we could find, a Chamberlain from Lowes. Because all we have to do is slide the door back and forth, a great deal of power isn’t needed. If you’re feeling fancy, maybe a screw drive opener would be quieter, but there’s really no need to get anything more than the basics here. The other you’ll need is a extension kit for your door. 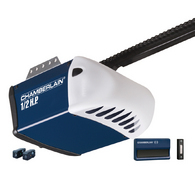 A standard garage door opener is designed with 7 feet of travel. Since the Eichler slider needs at least 7.5 feet to open fully, you’ll need this kit to ensure things open the entire way. While you’re in the store, also pick up some hanger brackets for the garage door opener. This resembles a long piece of flat steel, folded 90 degrees along its length and with lots of holes in it. In addition to the garage door opener hardware, you will also need to measure the distance between the beams in the garage. Get an 8×1 piece of pine that is high grade (without knots) and long enough to span the distance with a few inches to spare on both sides. Mount this board with screws parallel to the door and centered on the beams, with the front edge about six inches away from the boards. This distance doesn’t have to be exact, but we do need room for the garage door openers. Here’s a picture of the board with both openers installed, so you can see what we did. Buy four right angle brackets, Home Depot has some Strong-Tie A66 connectors which are the best I’ve seen so far. Look in your lumber section near where the deck supplies are sold. Also pick up some 1 inch lag screws with some washers, you’ll need 8 of them for the angle brackets and another 8 or so to mount the garage door opener hanger to the ceiling. While you are picking up the angle brackets, get about 8 linear feet of 1×4 oak. I’m going to assume that you or an electrician will install some grounded outlets on the ceiling boards within in the front corners of the garage. This is a fairly straightforward job which shouldn’t take more than a couple of hours. You will want to ground your outlets- for us, the cold water pipe leading to the exterior hose faucet was an easy source of grounding. The next step is to assemble the first garage door opener. Start on the side of the garage with the outer door, which is the door that is closest to the front of the house. This door should be on the side of the garage that has some space set back from the edge of the door. This is important, because the bracket you will attach will require the garage door opener to sit back fairly far from the door. Build a bracket like this, with the piece of oak attached to the angle brackets with lag screws. I only used two lag screws even though there are holes for four, to allow for greater clearance for the bracket as it must pass above the other door when opening. Also note that the bracket is attached just inboard of the hanging casters for the door. This is critical as it will ensure that the bracket will not hit the other door’s casters as it opens. Once this bracket is built and attached to the door, hang your garage door opener. 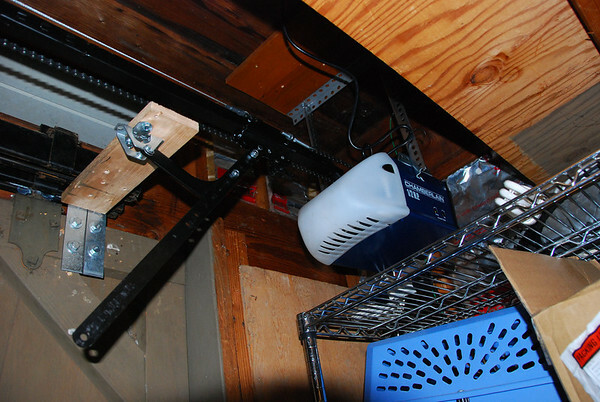 It should be fully assembled at this point so simply install the hang bracket in the ceiling of the garage and adjust it so that the opener is set back far enough to allow for the trolley to move back far enough to pull the door completely closed. Attach the header bracket for your track to the pine board you attached between the beams. The opener should be aligned so that the track is parallel to the door’s travel and as close as possible to the door itself. Once the bracket is hung, assemble the arm and bracket for the trolley. Connect the power and stand back as you enjoy seeing your garage door opener work. If all goes well, the bracket you made should slide in the gap between the inner door and the track as the outer door moves open. Of course, this also means that you should never try opening a door when the other door is open, as it may damage your door. Be sure to set the force limiting settings to be as low as possible. Also, the electric eye safety switch will not work, as the opener is set up in a ‘push to open, pull to close’ arrangement. This means that when the door is closing, the opener ‘thinks’ it’s opening, and ignores the status of the electric eye. I simply taped mine together. You can see in this picture that the bracket is sightly different, and designed so that it will never interfere with the other door’s bracket. Anyway, once you’re done you’ll be able to sit back and enjoy the satisfication of doing your own Eicher garage door openers. Here’s a video to give you a preview of what you’ll have when you’re done! Enjoy- and check out my Garage Door set on Flickr for more pics! Even though I’m no longer on the team, I’ll always be a big, big fan of Delicious (with or without dots) and the team. Seeing that thing launch last week with maximum fanfare and minimum drama was great to see, as that was something that I worked on for most of the last 18 months of my life as a product manager on Delicious. My friend and fellow ex-Yahoo wrote an excellent post on the topic. Contextual search: you can now search any view on the site. This is easier to do than describe- but as a quick example look at another person’s bookmarks. Do a search, and you’ll see results from their bookmarks. If you’re looking at one of their tags, then the results are from that tag on their bookmarks. Same goes for their network page. It’s incredibly flexible and great for finding bookmarks from your friends that were previously lost in the mists of the past. Deeper integration with the extension: With the new Delicious Bookmarks extension for Firefox, the website detects if you have the extension installed and integrates seamlessly with the import settings page. Simply go to ‘import bookmarks’ on your Settings page and we’ll take care of sending the data along for you- no more creating bookmark files and manually uploading them! Speed: It’s just way faster than before. I find myself browsing and searching Delicious a lot more because of the speed. If you have the extension installed, you’ll notice that we added a handy search plugin for your Firefox and IE search bars. Try it out! Anyway, my heartfelt congratulations to the team, I’m pleased as punch that things turned out the way they did.